ACDelco Disc Brake Pads are an ideal choice when it comes to quiet, confident and low-dust braking. ACDelco Disc Brake Pads have been formulated to the vehicle’s requirements to ensure safe and consistent stopping ability. Each Disc Brake Pad backing plate is protected by a premium powder coated finish, ensuring professional protection and appearance. ACDelco Disc Brake Pad’s friction levels are very stable across a broad range of operating temperatures, and create very low levels of dust. 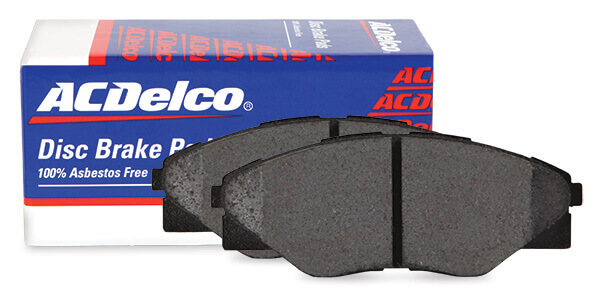 ACDelco Disc Brake Pads provide optimum noise suppression and performance using unique formulations and combined with shims, slots and chamfers where needed. The ACDelco Disc Brake Pad’s compound is of a specially formulated Non Asbestos Organic (NAO) material and is 100% asbestos free. ACDelco applications are designed to provide you optimum performance and durability.